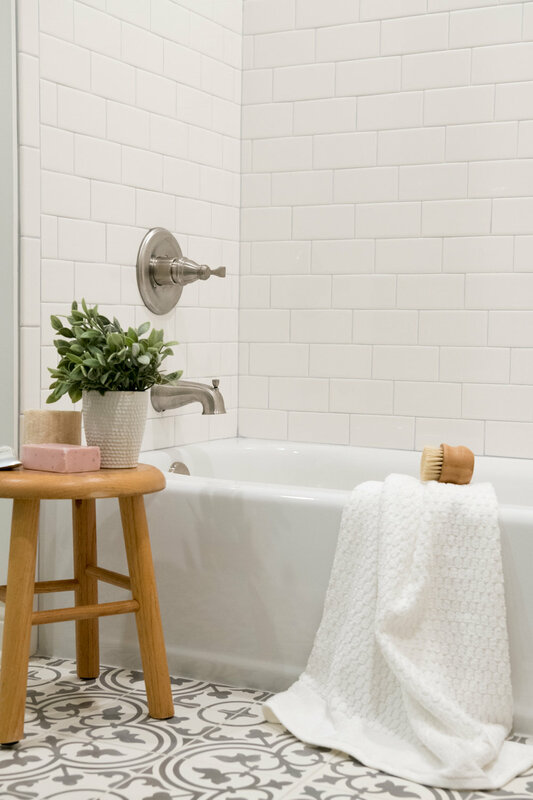 One of our longterm friends approached us to help transform their dated kid's bath into something that was both beautiful and functional for a busy family. Their design aesthetic is fun and not fussy, which we love. We brought in a bold pop of color on the vanity but left the rest of the space neutral to showcase the beautiful cement floor tile. When it came time to stage the space, we thought it'd be fun to do 2 fairly different looks to show how easy it is to make a big impact in a space by swapping out just a few key pieces. For one direction we kept it very calming and spa-like. For the other we punched it up with some bold colors and patterns. See some side-by-side photos below and let us know which one you like best! Now time for the before, during and after photos. As was typical in the 80s and 90s builds, this bathroom had unnecessary soffits over both the vanity and shower. Those were the first to go and as always, they made the space feel so much bigger once gone. We were surprised to find they did one of those "remodel your bathroom in a day" surrounds in the shower and just went over the old tile. So so so much water was leaking behind the surround. Shame on them! But then we started putting it back together and it was just so cute that we forgot all about the mold. Notice we did an extra layer of waterproofing (the pretty yellow "paint" around the shower walls) to prevent it from happening again. And now for the pretty afters! We link to all of the products at the end of this post so fear not if you don't see them here. 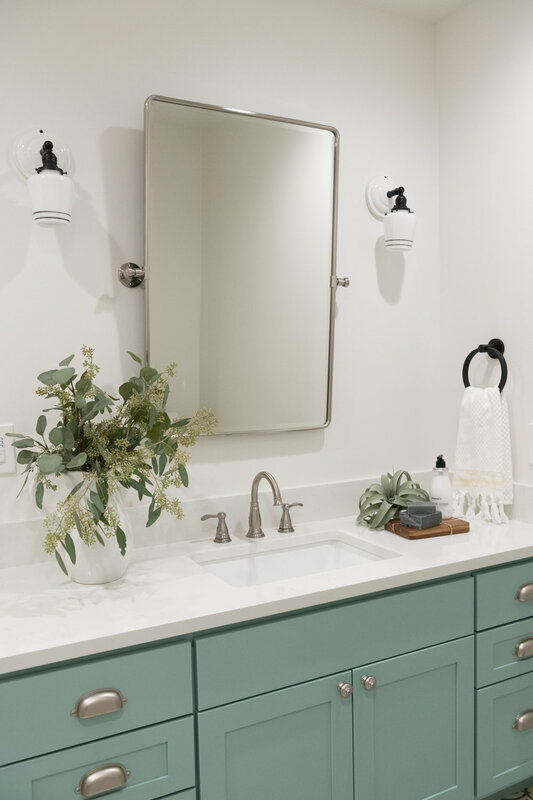 We did a beautiful custom quartz countertop with a subtle variation atop a bold mint green vanity. 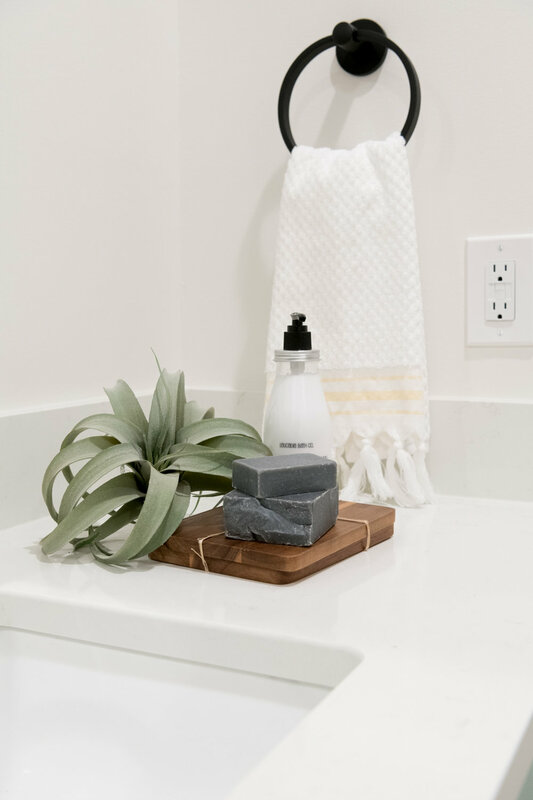 We brought in brushed nickel and black accents to play off the grey and white cement floor tiles, white subway tile and light grey grout. We kept the walls white to truly let the floor tiles and vanity speak for themselves in this space. What do you think, do you love it as much as we do? 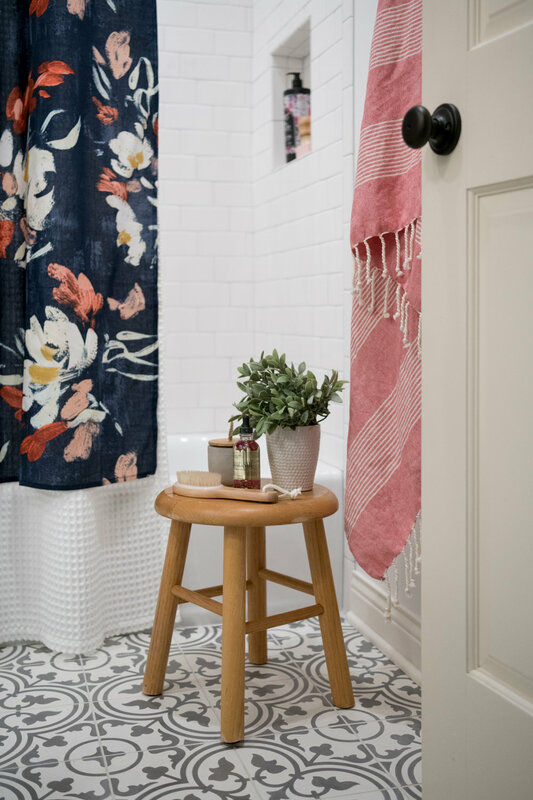 As mentioned up top, we staged this bathroom in 2 different ways in an effort to show how different you can make a space simply by swapping out some inexpensive pieces. In one direction we kept it serene and in the other we punched it up with bold colors and patterns. Which direction calls your name? We're torn over here! Staging items: White waffle shower curtain in white XL, basket next to tub, towels are a mix of Target and Home Goods and the white/grey/yellow fauta-like towel one is actually a shower curtain from Target. Red and white fauta towel is a few years old and from Home Goods. Navy floral shower curtain. 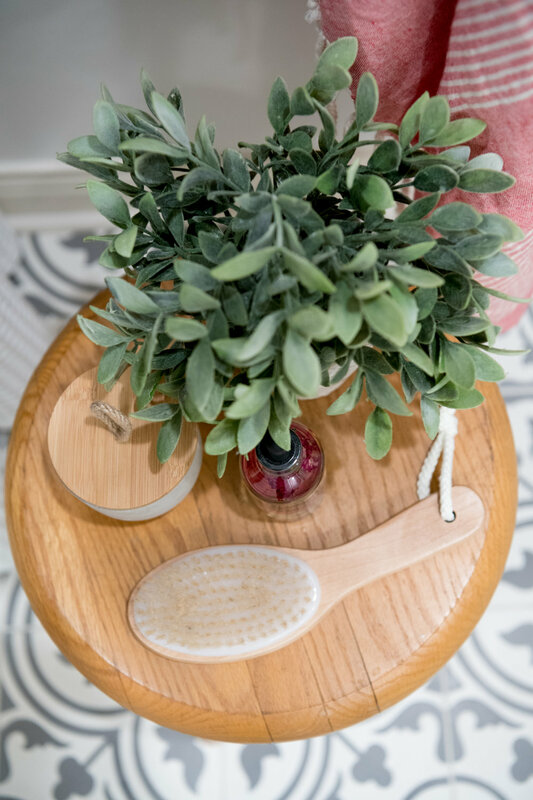 We have a bunch of small staging accessories that we reuse from project to project so have lost track of where they're from (stool, toiletries, plants, etc).